A ballet dancer is affected with cancer. Hercule Poirot, now in modern times, investigates the famous crime on the famed train with a modern twist. The Hostile Takeover is a tale of how an average pizza delivery guy named Jay gets caught in the middle of the largest territorial war in the city's history. As Jay avoids being killed by both sides in this brutal war, he must also prove his innocence to a trigger happy detective who believes he is the catalyst to it all. If you ever ask a German moviegoer if he or she has seen a good German action-thriller the probable answer will be: 'No'. The reason is simple: there is none. This film, however, goes in the right direction. 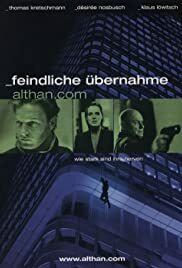 The actors, especially Klaus Löwitsch, Thomas Kretschmann and Martin Semmelrogge play their characters very well and the action scenes are some of the best I've seen for a long time (in a German film) as is the production design.